Title and Subtitle: Hot, Flat and Crowded: Why We Need a Green Revolution, and How It Can Renew America. Publication: Farrar, Straus and Giroux, hardbound, 438 pages, indexed, ISBN 0-374-16685-4; five Parts and 17 Chapters. 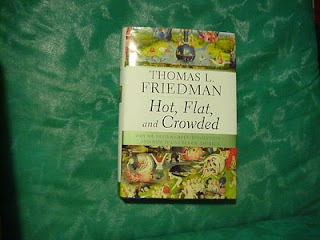 Friedman has previously authored “The World Is Flat: A Brief History of the 21st Century” from the same publisher, and recently appeared on NBC’s “Meet the Press” to promote his new work, which is one of the best and most convincing books so far to deal with the sustainability issues raised both by peak oil and, most of all, climate change. His thesis is straightforward and powerful. The planet is “reconciled” and most of the world’s peoples want to share the West’s patterns of consumption (with certain fanatical religious exceptions). We will soon make our planet unlivable, as the problems we create build at an exponential rate. He does state the scientific case that climate change or global warming is essentially man-made, and gives pretty much the same evidence as Al Gore, emphasizing the detailed evidence regarding carbon dioxide concentrations. The biggest cause of carbon dioxide concentrations is the burning of fossil fuels. Moreover, there are scenarios that could cause a lot of methane to be released into the atmosphere quickly (from former permafrost). With some humor, he notes that agriculture, specifically raising animals capable of flatulence, also adds methane. Politically and historically, the rise of standards of living in Europe and the United States, probably resulting partly from a colder climate and from botches efforts of previous civilizations, always seemed like a moral justification of democratic capitalism, whatever the inequities and bumps along the road. Totalitarian societies, particularly Communism in the Soviet Union and China, probably delayed the same level of consumption by its citizens, even if the Soviets especially were big polluters in other ways. The inefficiency of Communism and probably totalitarian societies including much of Islam, prevent the same level of consumption in much of the rest of the world. As a result of sweeping changes (the fall of Communism, etc) it now wants to catch up. Another problem is well documented: western consumers are supporting despotic governments of the oil producing states (particularly Saudi Arabia), looking the other way. The end result is that religious zealots can inflame idle young men in those countries with complaints both about the self-indulgence of western consumers and the religious infractions of occupying (and “invading”) their oil-producing lands. Such thinking can sift down to moral blame on the individual western consumer. He claims that even China is realizing it must change its ways as it migrates to capitalism, even if history has been a bit “unfair”. Nature, he says, knows only physics and mathematics and a finite planet. Nature doesn’t care about politics. He also suggests that America could become “China for a day” and, with some degree of Confucian authoritarianism, pass some draconian tax laws to nudge people into clean power, and give companies the right incentives (starting with cap and trade systems) to develop clean energy technology. At one point, he suggests construction regulation that is preferable to more draconian regulation (such as outright rationing of energy or many items) that could emerge. At one point, he stresses that we will soon have to reach a point where every citizen pays for what he or she uses immediately (in terms of depletion of energy and in terms of climate change, both against total finite limits) and not borrow from their children. That brings me back to the sustainability problem, at a personal level. Modern ideas of freedom suggest that the individual “develop the self” before being committed to familial relationships and communities. But most of the world doesn’t allow that much self-definition. Indeed, “individual sovereignty” can become dependent on an unsustainable technology that can implode (through natural disasters induced) or by attracting enemies who take it away. Individual standard of living can be predicated on the "unseen" sacrifices of others or on costs (such as carbon emissions) that the economy does not know how to assess. That may help explain some religious ideas based on living simply (and decentralized) with little technology but heavy emphasis on integrating everyone into familial social structures, whether the Amish or tribal radical Islam in some parts of the world.